We have officially made it beyond 2018 midterm election day in the United States — well, mostly. Democratic gubernatorial candidate Stacey Abrams is in a critical fight to challenge voter suppression in Georgia, a recount looks likely in Florida and other races remain too close to call. As we stay engaged to make sure all the votes are counted, we also begin to shift toward reflection, recalibration and recommitment. What have you felt in your body this week? I’ve been anxious, energetic and scrambling to do all the things I could to make a progressive impact this election, overriding the exhaustion. Last month, I shared the perspective of organizers with the Sunrise Movement on electoral versus movement strategy, who argued that we shouldn’t lean on elections as the solution for the change we need. However, they said we have a responsibility to reduce harm with our votes — especially in the wake of escalating white nationalism — which has felt heavy and urgent. For my recently released Healing Justice podcast episode (which you can listen to in full on RadioPublic, Apple Podcasts or Spotify), I spoke with friends I deeply admire — including Maurice Mitchell, Barbara Dudley and Alexandra Rojas — to help digest what happened this election and navigate what comes next. Mitchell is the national director of the Working Families Party and a leader in the Black Lives Matter Global Network. Dudley has over 50 years of activism experience, working with the National Lawyers Guild, Greenpeace and the AFL-CIO. She also co-founded the Working Families Party. And Rojas is the executive director of Justice Democrats and a Bernie Sanders 2016 campaign alum, who helped recruit Alexandria Ocasio-Cortez to run for office. With the world drowning in spin and hot-takes, we came together to hold a different kind of vulnerable, real-talk space to process our wins and losses and work to understand what comes next for our movements. What was important about this election cycle? 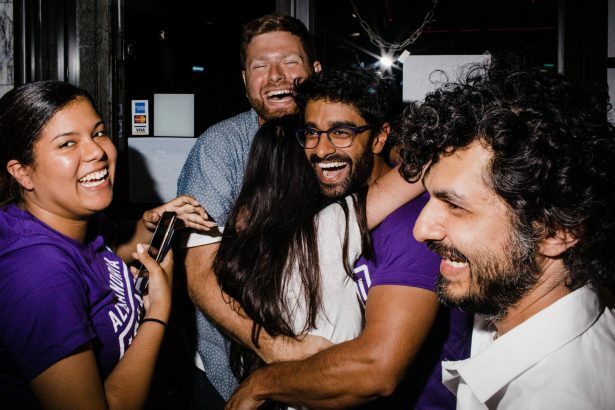 Alexandra Rojas: The biggest victory of the night belongs to Alexandria Ocasio-Cortez, who pulled off one of the greatest upsets in modern American history. We proved that America can still be a country where a working-class woman of color can defeat a 10-term Wall Street-backed incumbent. We have a Congress that is majority men, majority millionaires, and doesn’t reflect the diversity of America. But we made great strides on that this week. The only way that we gain power in the halls of Congress is by continuing to run. Getting new people involved, and putting new working-class leaders in people’s faces will make this the new norm. Barbara Dudley: After a lifetime of disdaining electoral politics, I realized that my generation of left activists had abandoned the arena to the right wing, which had taken full advantage. So it’s been time to jump in. If one election cycle can create an economic crisis, the next can turn it around. Read and listen to the entire story/podcast featuring grantee Healing Justice Podcast.